It is an impulse and you do it unknowingly while watching television or working on a laptop or even reading a book; the habit of nail biting is one which stays with you if not corrected during childhood days. There are certain people that never need a nail cutter because their teeth do the job well. That is not just unhealthy but also gross. 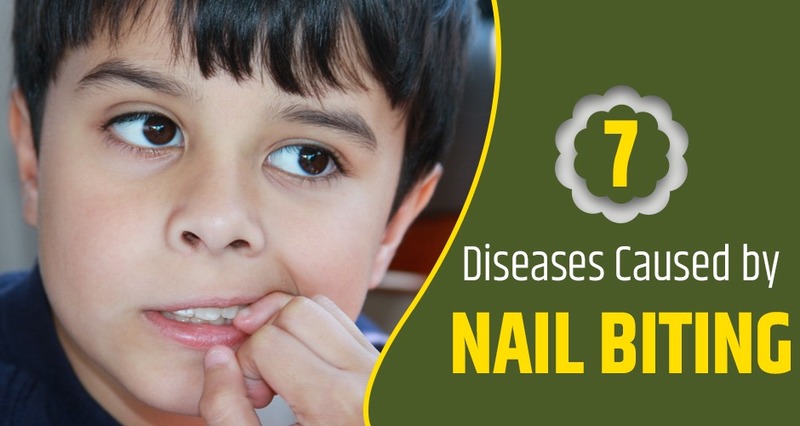 In this article, we will talk about diseases that are caused due to nail biting. What is the habit of nail biting? The habit of nail biting is scientifically known as onychophagia- this is an oral parafunctional habit. That means the use of the mouth for a purpose other than speaking, eating, or drinking, mouth breathing, chewing, sucking or grinding teeth. Nail biting begins during early childhood days. It increases substantially during adolescence, and declines with age, although the habit may continue well into adulthood. If this becomes a serious issue, nail biting is often classified as an obsessive-compulsive and related disorder. Why do children bite their nails? Children bite their nails due to many reasons like – out of curiosity, boredom, to relieve stress or from force of habit. Nail biting is the most common sign that one can see as part of “nervous habits”. Other habits include thumb sucking, nose picking, hair twisting or tugging, and tooth grinding. If this is a nervous issue, the habit of nail biting may continue well into adulthood. Staphylococcus aureus is a type of bacteria found in the nails that causes staph infection. If your child takes in this bacteria due to nail biting it can cause boils on the skin, respiratory infections, as well as symptoms that are similar to food poisoning. This bacteria is resistant to antibiotics, making it difficult to be treated. Mostly when your child does not wash their hands, Escherichia coli, more commonly known as E.coli, is a type of bacteria that can grow inside the nails. E.coli is typically found in feces, and contaminations are caused by not washing your hands most of the time. Thus the bacteria remains inside the nails and your child might ingest this bacteria while nail biting. And even if your child does wash their hands, there is still a chance that there’s E.coli under the nails; so washing hands and nails properly becomes very important. This is caused by HSV or the herpes simplex virus. This contagious diseases is transferred by the hands and biting nails and can cause swelling and redness in the fingers, lesions on the fingers and nail bed, fever and swollen lymph nodes. Also known as yeast bacteria, these are found under the fingernails but can cause the infection to spread in the entire body. In some severe cases, it can also infect the heart, brain, eyes, bones, eyes, as well as other parts of the body. The harmful bacteria and dirt found in your nails thrive in the cozy crevice beneath the tips of your nails. When you bite your nails, those harmful bacteria end up in your mouth and gut. Here they can cause gastrointestinal infections that lead to diarrhea and abdominal pain. This is a type of disease that long term, habitual nail biters suffer from. Tears or abrasions in the skin of the fingertips allow strains of bacteria or yeast to get inside. This causes swelling, redness, and a buildup of pus around and under the nail, and makes the fingertips inflamed. HPV is a wart virus which is very common among nail biters. After infecting the fingers, these warts can then spread to the mouth and lips as well. Constant nail-biting definitely leads to poor dental health. A biter’s teeth shift out of position or become oddly shaped. Nail biters also suffer from higher rates of gum disease and infection. For most of the people nail biting is an impulsive or a psychological disorder that can be caused by stress. Sometimes dentists prescribe special ointments that can be applied onto your nail. So when you bite on them unknowingly, the bitter taste of it will eventually stop you from doing that. When it comes to nail-biting, nagging or punishing your child will not do much, because the child cannot control this impulsive habit. Gently and consistently calling his attention to the fact that he’s biting his nails may help. Set limits like ‘No biting nails at the dining table’ or ‘No nail biting when we are outside’. This will stay in your child’s mind and the next time they take their nails, you can stop them. All you can do is explain in a compassionate way that this is an annoying and very dangerous habit and can cause your child to fall sick. Most of the time, stop him/her when you see them do it. What you can do is wait it out, eventually, your child will be out of this habit.